Before the time period commonly associated with the modern feminist movement, authors such as Charlotte Perkins Gilman and Charlotte Brontë were creating work that challenged and critiqued the treatment of women in U.S. and British society and culture. 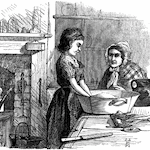 Influenced by contemporary events like the Seneca Falls Convention of 1848, these short stories and novels pre-sage momentous changes in the 20th century, such as the passage of the Nineteenth Amendment to the U.S. Constitution in 1920 and the Representation of the People Act in Britain in 1928. These stories represent changing attitudes toward the rights of women and the roles women play in society. In addition to fiction, you will find Civil Rights and Conflict in the United States: Selected Speeches which includes Elizabeth Cady Stanton's 1892 "Solitude of Self" speech and Susan B. Anthony's 1872 speech, "Is It a Crime for a Citizen of the United States to Vote?" Jane Eyre is a classic novel by Charlotte Brontë which was published in 1847. Jane Eyre, an orphan, must find her own way in the world while learning about friendship, family, love, trust, societal roles--and how to deal with dark secrets. The Scarlet Letter, published in 1850, is set in Puritan New England in the 17th century. Exploring the issues of grace, legalism, and guilt, it tells the story of Hester Prynne, a Puritan woman who commits adultry then struggles to create a new life. Little Women concerns the lives and loves of four sisters growing up during the American Civil War. It was based on Alcott's own experiences as a child in Germantown, Pennsylvania with her three sisters, Anna, May, and Elizabeth. This collection includes notable speeches from U.S. history concerning slavery, women's rights, racial equality, conflicts with Native Americans, and capital punishment. Following the birth of her child, the narrator is cared for by her physician husband at a country estate.